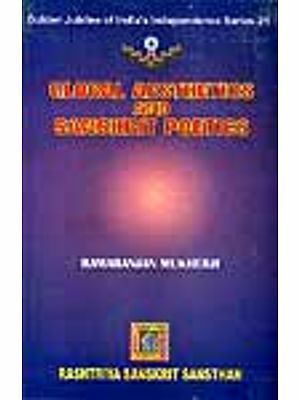 Glimpses of India Poetics, containing 21 essay, would furnish a valuable material on the subject. The eassy' A Survey of Sanskrit (Indian) Poetics' provides the readers a wide panorama of the history of the subject of about one and half millennium. The definition of Poetry, of course, cannot be presented in well-knit, accurate and precise form. The author agrees with the definition put forth by Jagannatha, though with some modification as 'Ramniyata-Pratipadico Shabdartho Kavyam'. The essay 'The Soul (Essence) of Poetry' deals with the topic in much detail and dhvani has been designated as the soul of poetry. The readers would appreciate the essays like 'The Nature of Aesthetic Pleasure' and 'Sadharanikarana' ('The Theory of Generalization) expressing a marvelous substance about what the poetic delectation is and how it is achieved by a sahrdaya (compassionate) through generalization. The essay 'The process of Poetic Creation' traces the psyche of the poet about the very moments when he actually becomes absorbed in composing his literary piece of work. The articles 'Causes of Poetry' and 'Originality and Plagiarism' deal with creative activity of the poets of different caliber, and the essay 'Acting, Actor and Spectator' denotes how and upto what extent the spectator is influenced by the acting of the actor performing his hob on the stage. The other essays, connected with various alamkaras and rasas, highlight and elucidate the academic issues related with them. The book presented in clear and lucid expression and style is studded with authentic quotations and appropriate illustrations. The author hope that through his modest attempt some of the readers may cultivate the desire of studying some of the original texts on Poetics written in Sanskrit itself. 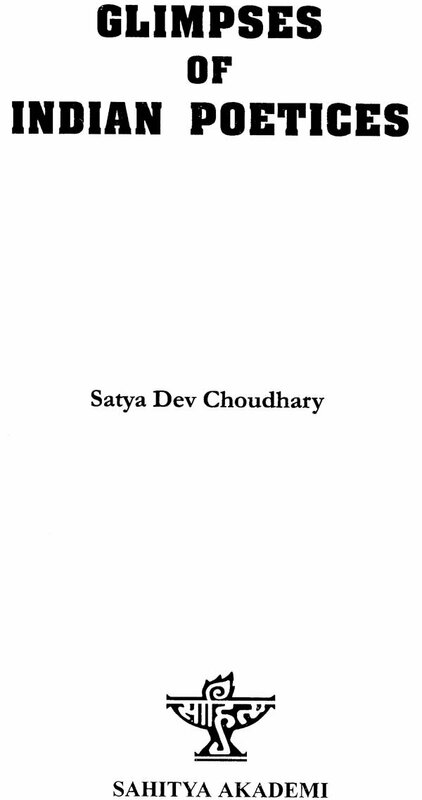 Dr. Satya Dev Choudhary, Shastri, M.A. (Sanskrit & Hindi) both in 1st class and Ph.D.(Hindi) from the University of Delhi, taught in the University of Delhi for about 35 years and for one year as a Guest Professor of Hindi & Sanskrit in the Deptt. of Indology, University of Tubingen (W. Germany). He has about 25 book to his credit and for them has been felicitated with a number of prizes and awards from the Panjab and Uttarpradesh Governments. Presently, he is the Director of Ramkrishan Jaidayal Dalmia Shrivani Nyas, Delhi. Major works: Dialogue hymns of Rgveda (in English & Hindi), The Bihari Satasai in English free verse. Glimpse of Indian Poetics; Bhartiya Kavya-Shastra, Bhartiya Shaili-vijnana, Hindi Ritiparampara ke Pramukh Achariya (Thesis). Hindi Abhijnana-shakuntala in free verse, Ishopanisad (in Hindi & English free verse) etc., and also a good number children books in Hindi & Sanskrit. I am glad to present a book before my benevolent readers on different aspects of Indian Poetics, which is a vast and profound discipline of learning–not found in such a subtle as well as detailed form and developed tradition in any language of the world .This branch of learning attracted me from my student life and it remained my favourite subject till this date which I studied, taught, did my research on it and guided my students to do so for about five decades and authored a number of books on it. This book, containing twenty one essays, I believe, would furnish a valuable material on the subject. The essay 'A survey of Sanskrit (Indian) Poetics', as an introduction of the book, provides the readers a wide panaroma of the history of the subject of about one and half millennium. It depicts the different view points of outstanding acaryas (aestheticians) about the following Schools of Thought –Rasa, Alamkara, Riti, Dhvani, Vakrokti and Aucitya-evolved and developed from time to time, and the influence of these acaryas on the subsequent writers on the subject. The Definition of Poetry, of course, cannot be presented in well-knit, accurate and precise form. The Indian acaryas throughout this long period of time- from Bharata to Panditaraja Jagannatha- have tried their best to do so. I agree with the definition put forth by Jagannatha, though with some modification as 'Ramaniyata-pratipadkau sabdarthau kavyam'. 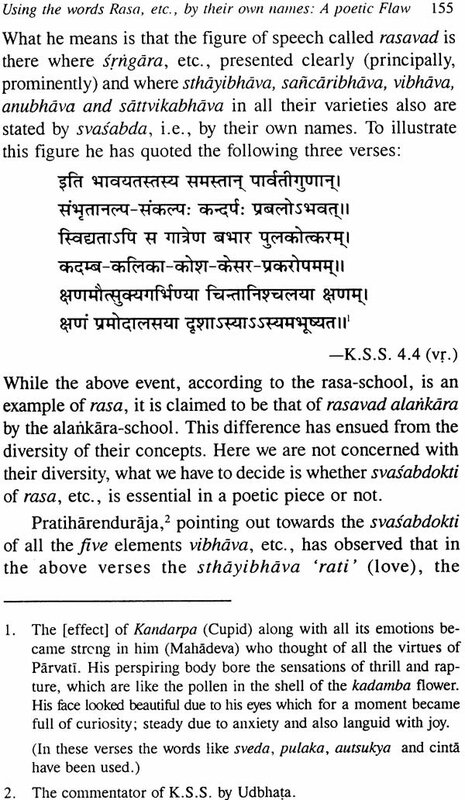 The historical survey of this remarkable academic effort, it may be noted, enables us to understand more vividly the nature and character of the technical terms of this discipline like sabda and artha, rasa, alamkara, riti, guna, dhvani, vakrokti and dosa, and also their relationship with each other. The essay 'The Soul (Essence) of Poetry' deals with the topic in much detail and I quite agree with the great acarya like Anandavardhana that dhvani is the soul of poetry. The readers would certainly appreciate the essays like 'The Nature of Aesthetic Pleasure' and 'Sadharanikarana' ('The Theory of Generalization') expressing a marvellous substance about what the poetic delectation is and how it is achieved by a sahrdaya (compassionate) through generalization. Such type of psychic treatment about the subject, it is believed, might not be available in explicit and point-blank form in any treatise of Poetics accept in Sanskrit. The essay 'The process of Poetic Creation' traces the psyche of the poet about the very moments when he actually becomes absorbed in composing his literary piece of work like poetry, drama, story or novel. Similarly the articles 'Causes of Poetry 'and 'Originality and Plagiarism' deal with the creative activity of the poets of different calibre, and the essay 'Acting , Actor and Spectator' denotes how and upto what extent the spectator is influenced by the acting of the actor performing his job on the stage. The other essays, connected with various alamkaras and rasas, highlight and elucidate the academic issues related with them. An article entitled 'Perceptlike Experience in Bhavika Alamkara' written by my friend, the late Dr. R. C. Dwivedi has been included in this book with his prior consent. In fact I could not resist the temptation of including it among the essays on alamkaras. The book has been presented in clear and lucid expression and style as tar as possible. It is also studded with authentic quotations and appropriate illustrations wherever they are needed. These would certainly help the readers understand the scholarly issues and subtle points discussed in it. I hope that through this modest attempt of mine some of the readers would cultivate the desire of studying some of the original text on Poetics written in Sanskrit itself, and if that happens, it would be a great reward for me in offering this book to them.